I’ve mentioned on numerous occasions that the fire curing process, and the tobacco it produces, intrigue me to no end. I am familiar with the various iterations of fire cured leaf that makes an appearance in pipe tobaccos, but until very recently had never seen it used in a premium cigar. 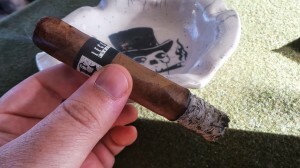 The Black may very well be a harbinger or bellwether of things to come – as I’ve now seen a couple other cigars in the works that will/do contain some type of fire cured tobacco. In any event, today’s example is the 552 (5″X52) from the Black lineup – which retails for approximately $8 in South Florida. The line is also available in 4″X46, 6″X50, and 6″X60 – and is distributed by Torano. All that being said, let’s fire up the fire-cured…. The Black is medium brown in color, with a slightly golden hue. I find no soft/hard spots across the length in any of the four I have now smoked. The draw has been exceptional as well. Actually, the construction has been spot-on in all examples. Before lighting, I find a pleasantly savory draw. The uniqueness of the fire-cured is most prominent on the draw and the aroma at the foot, and reminds me of some oriental blends of pipe tobacco (for those versed in pipe tobacco, I do NOT draw any correlation to typical flavored tobaccos; my intent here is that it reminds me of traditionally (also fire-) cured oriental tobaccos – in particular, some of the regional component varietals common in the near/middle east). The aroma on the wrapper is less pronounced, with a slight barnyard bent. The initial puffs produce a great deal of smoke and a good bit more spice than expected. The spice is nicely controlled, and doesn’t even approach the nasal napalm found in some Nicaraguan blends. During the first inch or so, the spice continues, remaining very pleasant with the slightest bit of smoky sweetness on the finish. I have noticed a trend in the Black for carrying a bit of a scalloped burn, but overall it has been quite well-behaved. The smokiness of the Dark Fire is far more subdued than I had expected. In single malt circles, it would be more akin to Dalwhinnie than Laphroag. It is clearly present, but with an almost honey sweetened overtone rather than in-your-face or shrill peat. Into the second third, I think this cigar really comes into its own and shines. It provides tons of chewy, leathery, smoky goodness. Again, I find myself surprised at the subtlety of the Dark Fired – probably because I had expected it to be more pronounced. The leather that comes into play during this portion is very complementary to the sweet smoky flavor palette, and provides a clean backdrop to just sit back and enjoy the smoke. I was surprised by the subtlety of the Dark Fire, based on my preliminary impressions of what this cigar might be. This subtlety is what makes the blend a homerun. Had Sam chosen to make something more brash that single-mindedly drew attention to the fire cured leaf, it might have strayed into being seen as a gimmick or marketing ploy. As it is, I find it to be a very interesting new addition to the blending lexicon. The Black is a fantastic foray into the use of something different – without taking away from traditional cigar flavor profiles. 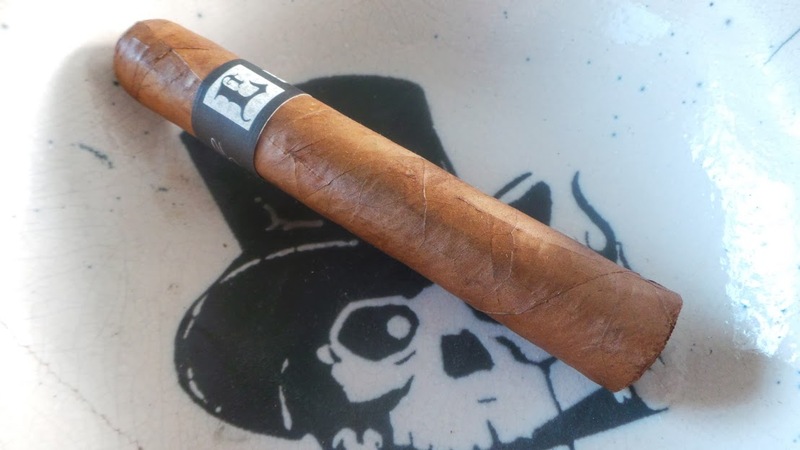 I don’t assign numerical values in my reviews, opting to just describe my experience with a cigar in terms of construction, value, flavors, availability, etc. – but if I did, the Black would rank exceedingly high on any scale. I would highly recommend it to anyone. Anyone. This is a cigar you owe it to yourself to try. Very nice review! I wish I could find these in So Cal to pick up a few. I’ve been on the fence…now going to pull the trigger on a box. Nice review. I was also surprised at how little the fire cured tobacco comes out in the smoke because the pre light smell is so strong. I do like the White better but still enjoy the Black also. Great review. Ordered a box of 650’s from smoke inn. They had a event with Sam recently, and the word is everyone loved the black. Anyways I think I might have to burn a rott, I’m so excited. Cool review, Kip. Gonna have to get me some when I am back in town! Just smoked a Black that I received at Cigarfest. You’re review put my experience into words better than I could. I agree it is more of a medium body than a medium-full most reviews have it as. By far this was/is one of the weirdest smoking experiences I have had to date(albeit short). I agree with yours and Dan’s assessment that it is medium bodied. I found that anything over the robusto size a bit much for my taste. This is a must try! It’s great to see Sam back in game. I have had 4 also and I am extremely happy with my blind box purchase. I am also excited to see what else he has in store for us. 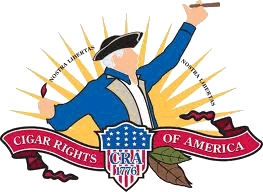 I am not a flavored cigar smoker, I don’t like manufactured flavors. The subtle way Sam used the fire cured leaf was sublime. Now I think I’ll get a box of the white, and see what he has done there. i chose to read this review because i am contemplating purchasing leccia black and i thank you for your input,needless to say i am excited now! Thanks for stopping by, lena! 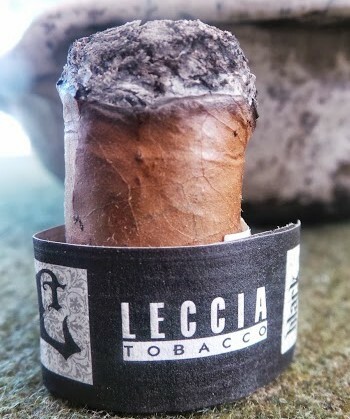 The Leccia Black is a fantastic cigar, and one of those things that most people I’ve talked to are polarized over – they either love the idea of hate it. I happen to love it. I think it’s a great blend and showcases the firecured tobacco without “overdoing” it.